The European Union Wins The 2012 Nobel Peace Prize : The Two-Way While acknowledging the crisis the 27-nation coalition is experiencing, the committee said the experiment shows that through the building of "mutual confidence ... historic enemies can become close partners." 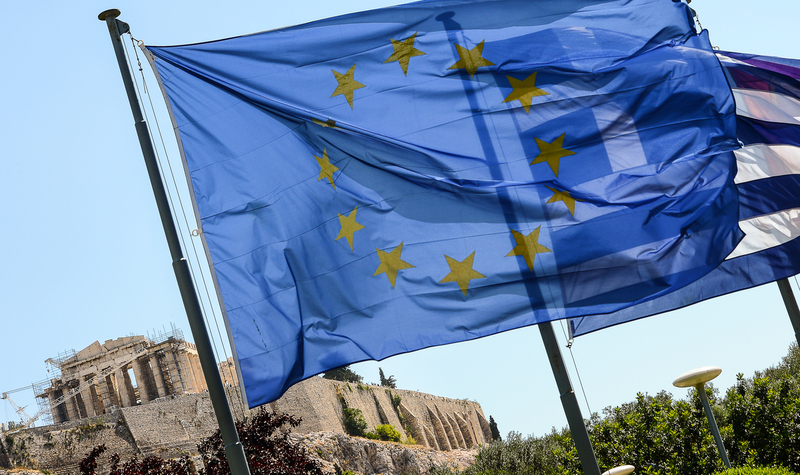 European Union flag and Greek flag wave in front of the Acropolis, in central Athens. The Norwegian Nobel Committee has bestowed its prestigious Peace Prize upon the European Union for what it says is a six decade contribution "to the advancement of peace and reconciliation, democracy and human rights in Europe"
In its press conference, the committee said the union cemented peace between France and Germany and shows that "through well-aimed efforts and by building up mutual confidence, historical enemies can become close partners." Of course, this prize comes just after the European Union has faced one of its toughest years — its existence essentially threatened by the sovereign debt crisis that has gripped its poorer members like Greece, Spain and Ireland. Consider this: The most recent image of European discord is that of German Chancellor Angela Merkel's visit to Greece this week. Merkel was received by mass protests, including some demonstrators dressed in mock Nazi gear. "This is, in a way, a message to Europe that we should do what we can to secure what we have achieved," Thorbjørn Jagland, head of the Oslo-based Nobel Committee, said during the press conference announcing the prize. "The Norwegian Nobel Committee wishes to focus on what it sees as the EU's most important result: the successful struggle for peace and reconciliation and for democracy and human rights. The stabilizing part played by the EU has helped to transform most of Europe from a continent of war to a continent of peace." As you might expect, some jokes have already been made at the expense of the prize. "If the EU really has won the Nobel prize, will Germany collect the prize, then refuse to share it with the Greeks? #amiright"
The winner of the Nobel receives $1.2 million. It's unclear how this will be split up. Martin Schulz, the president of the European Parliament, took a more sober approach on Twitter. "The EU is an unique project that replaced war with peace, hate with solidarity," he wrote. "Overwhelming emotion for awarding of #Nobel prize to EU." He added that the prize could "serve as inspiration." As The New York Times notes in its story, the announcement comes "against a global backdrop of conflict, with civil war in Syria threatening to spill across the region, the Afghanistan war grinding into a second decade and earlier hopes of a new era of tranquillity in the Middle East largely abandoned." So the prize is a bit of a surprise. Many, reports the paper gave front-runner status to "Gene Sharp, an American political scientist and theorist of nonviolent resistance." Others even mentioned former President Bill Clinton or the figure heads of the Arab Spring movement.